Did you know that traditional store bought marshmallows contain ingredients like blue dye, tetrasodium pyrophospate and artificial flavor? Ick. Not for my kids. Our house is chemical free, which means nothing artificial in our food either! We also avoid corn syrup and cook with a lot of vegan ingredients. 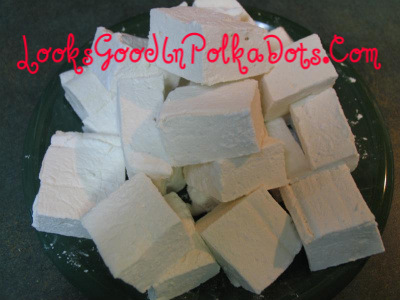 These are the best ever marshmallows, perfect for topping hot cocoa (or adult beverage of choice) or whipping up in sweet potatoes and krisp rice treats. 3 T. of unflavored Gelatin (or sub 2 tsp. Agar Agar Powder or 3 T. of Agar Agar Flakes) You can find non animal derived jel like Lieber’s at Kosher and Natural Markets. In medium saucepan combine remaining water, cane sugar, agave and salt. Cover and cook for about 3 minutes. Uncover and continue to cook until mixture reaches about 235-240 degrees F (soft ball stage). Once temperature is reached remove from heat. Spray a 13 x 9 inch rectangular pan with non-stick cooking spray. Combine powder sugar and corn starch in a small bowl. Sprinkle mixture in pan to coat, cover pan and shake to fully coat. Now you can add the mixture to the pan. It is difficult to spread. Use a rubber spatula coated with non stick spray or oil. Once spread out in the pan, sprinkle the top with more of the sugar/cornstarch mixture, cover w/ cheesecloth or thin towel and allow to set up over night. Cut into 1 inch pieces and store in tightly sealed container at room temp. Photograph from Looks Good In Polka Dots, my personal blog. This is a great receipe and one that our readers are sure to enjoy, may we post your receipe with reference to your site. Our site is working hard to collect sites of interest that are driving our nation to a quality foods that do not contain unnecessary additives and certainly not harmful ones. You can find us at http://healthylife.rmtrain.com. Yeah! I have marshmallows! My problem was the Agar Agar. Gelatin did the trick 🙂 Thank you for an awesome recipe! Thanks so much for the receipe. I recently took a great candy making class where we made beautiful marshmallows. The question of a vegan substitute for gelatin came up. I think agar agar was mentioned but not really explored. Thanks again. Do NOT make this recipe using agar flakes! It might work well with gelatin, but the agar flakes did not work (the mixture never got stiff enough). The resulting goo can’t even be used as marshmallow fluff, because the agar does not dissolve (and those little flakes are not appetizing). I’m tempted to try the agar powder (I’m vegetarian and would love to be able to make my own veggie marshmallows), but I have a feeling I’d end up with the same sticky mess. What got lost here is that when you use agar agar, you must first bring it to a boil in water and simmer it for 15 minutes…and then add it to your recipe. When it cools, then it gels. Tried making these with brown rice syrup, did not work at all. I think the rice syrup is too heavy, Any suggestions would be helpful. Is it possible to make this with no cane sugar, powdered sugar, or corn starch? I think you mixed up the measurements for the agar powder. 2 tsp doesn’t sound right at all, that could explain why my mixture hasn’t set. Cook’s Thesaurus: “Substitutes: gelatin (Substitute one tablespoon powdered gelatin for every tablespoon of powdered agar. ” Wouldn’t that mean the recipe calls for 3 T of Agar Powder? I tried 3 T of Agar Agar and it was a total wasted FLOP. Never fluffed up and became gooey thick and “gellie.” I tried the recommended 2 tsp of Agar Agar and it was another wasted FLOP. Totally liquified. No fluff. So discouraged. 🙁 I need this recipe to work for my son’s 2 year old birthday party next week. Glad I am testing it out a week in advance and not the night before! this is the third agar marshmallow recipe I have tried tonight, and none of them work. I also made them with agar agar and it was a big flop. Could someone tell we how to use the agar agar. We are vegan want to make marshmellows for a special treet. I try to avoid agave nectar since they are not sure its actually healthy….my question was do you think you could use brown rice syrup instead? Thanks! This recipe is not corn free. I know that it says corn syrup free and that’s great but if you’re going for completely corn free, make your own powdered sugar or buy some thats made with tapioca starch (Wholesome Sweeteners at Navan Foods). And replace corn starch with arrowroot or tapioca or potato starch. THIS recipe actually works, I’ve made it many times and used sugar cane syrup. http://www.cookingforengineers.com/recipe/106/Marshmallows My food processor wasnt strong enough to get the sugar extremely powdery though so I used Wholesome Sweeteners powdered sugar. These are wonderful and so easy to make and clean up! Thank you for the detailed recipe.